NEVILLE Southall has been sensationally sacked as manager of Hastings United Football Club. The former Everton and Wales goalkeeping great (pictured right) was dismissed by chairman Dave Walters on Wednesday afternoon after almost a year at the helm. 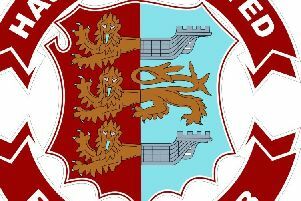 Hastings sit a disappointing eighth in Ryman Division One having claimed just one point from the last five games after an 11th place finish last season. "Unfortunately there have recently been an increasing number of issues on which Neville and I have disagreed," Walters said, "and it had got to the point where our working relationship had broken down beyond the point of repair as far as I was concerned. "However there is no animosity between us and we wished each other the best of luck for the future. I would like to record my thanks to Neville for his considerable effort and commitment in trying to take the club further." The sacking of Southall, who was unavailable for comment, has since been followed by the resignations of assistant manager Vince Moorton, coach Terry White and recently-appointed reserve team manager Alan Green. "I've resigned because I think it's the wrong decision," Moorton commented, "and it's a stupid decision. I'm very disappointed to have to sever my links with the club having been there four years and I personally think it's a knee-jerk reaction. Okay we've had a blip in form, but on the whole we thought we were going in the right direction." White commented: "When Neville first took over somebody wrote a letter to the club saying, 'don't trust Terry White, he's only after your job'. So I said to Neville, 'if you go, I go'. "Dave Walters did offer me the job in a caretaker capacity and it's the only job at this level I would want, but I've got to honour what I said to Neville for my own integrity." So the search for another new boss begins, but Walters is to set about his recruitment programme in a different way this time around. "The plan's not to advertise at the moment," he said. "I'm aware of managers who are out of work at the moment and I know in my mind who I would like to get. "I'm not really setting a time-scale and I'm not going to panic because there's no need to. We've got plenty of time to turn this around." Pat Brown, Nigel Kane and Walters will look after team affairs at bottom-half outfit Bashley tomorrow (Saturday), with the chairman set to pick the squad. Hastings then play host to Metropolitan Police on Tuesday evening, kick-off 7.45pm.